This entry was posted in Migrate to UK and tagged Move to UK Travel to UK types of UK visitor visas visitor visa to live in the UK on July 2, 2016 by Blog Author. Visiting these historical landmarks and seeing those amazing books you’ve read come alive is a quite surreal. It’s like a walk in the memory lane of these noted Literay scholars and see what inspired them to write those timeless classics. Join us as we take a tour into the lives ofv those great authors who have changed the course of the language “English”. Our first stop has to be Stratford-upon-Avon, the Great Bard’s hometown. In this town you can see Mary Ardern’s House, the home of Shakespeare’s mother; Hall’s Croft, his daughter’s home; and Anne Hathaway, his wife’s cottage. Do not miss out the plays in the Royal Shakespeare Theatre, dedicated to the Bard. The most famous poem written by Wordsworth is taught in every school. Our next stop is Dove Cottage in Grasmere the home Wordsworth for eight years. He lived there with his wife Mary and his sister Dorothy. The author of children’s classics like Oliver Twist, David Copperfield and Great Expectations, spent his childhood in the docks in Kent. 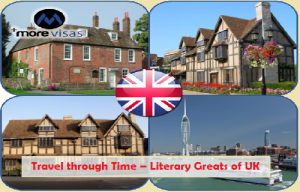 Portsmouth has museums dedicated to his literary works. An author who broke stereotypes of her era, Jane Austen wrote many books including Pride and Prejudice, Jane Eyre and Emma. Her Chawton Cottage in Hampshire has 200-year-old prints of Pride and Prejudice. Jane Austen Centre in Bath is the next stop as she drew her inspiration from this place. Do you know who Acton, Ellis and Currer Bell are? These were the pseudonyms of Anne, Emily and Charlotte Bronte. They lived in an era where women did not have the right to become an author. They lived in the vicarage of the Yorkshire West Ridings village of Haworth, which is converted into a museum. If your interests have peaked with this mini tour of handful author’s, then get going and grab your UK Tourist Visa. For further information, you can visit our website morevisas.com or one of our centers in different cities where our visa consultants will be more than happy to guide you.